Thank you to everyone who joined us on the evening of April 27 at St. Sebastian Catholic School. We discussed the findings of the environmental studies, including noise and vibration assessments, and viewed some new renderings that were created in response to feedback to see different vantage points in relation to the overpass and multi-use path design. 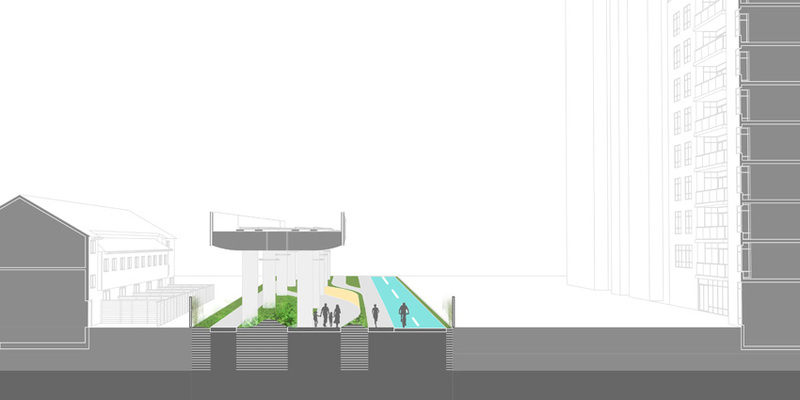 As requested, we have prepared several new views of the Overpass to provide different perspectives. 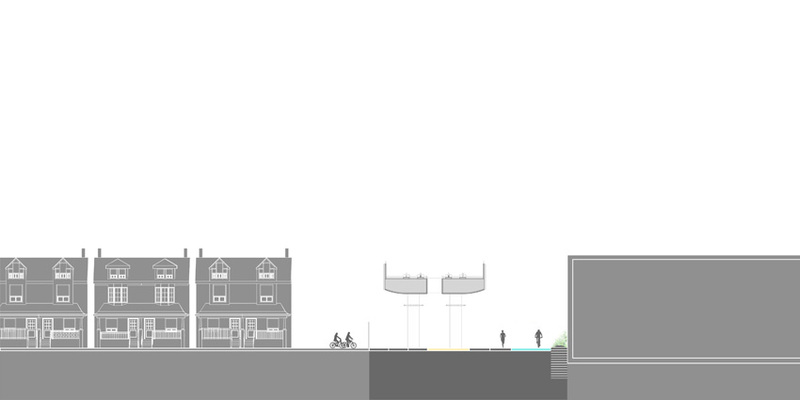 The viewpoints provide backyard views, views from higher elevations, and at different locations to better show how the Overpass will look in other areas. We look forward to your feedback on these views. On January 18, a community meeting was held to discuss the design direction and next steps for the Davenport Diamond Grade Separation project. Attendees were provided with an overview of where this project has come from, where it is today, and where it is going. Also, the initial Design Direction study was introduced to the community in response to the feedback that has been received from residents. 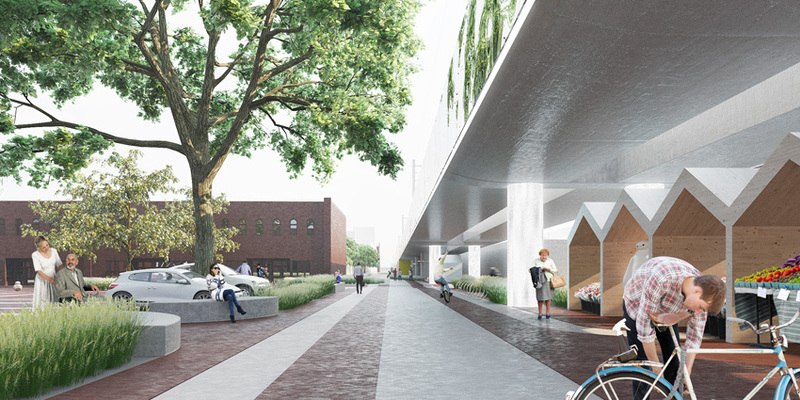 The goal of the initial design is to minimize the visual impacts of the overpass and to ensure that the project is a long-term asset to the community. The award-winning design team that was brought together focused on the challenges of shortening the elevated portion of the overpass, lightening it, and looking for way to increase community connections across the corridor. The Design Direction study also addresses a number of concerns that have been raised by residents such as safety and lighting. We will continue to work with the community and the City of Toronto to strengthen the project by mitigating concerns and impacts through the design process. This will include developing a community advisory committee to help direct Metrolinx on what is possible with the Greenway underneath the Guideway (overpass) and to continue refining the design. 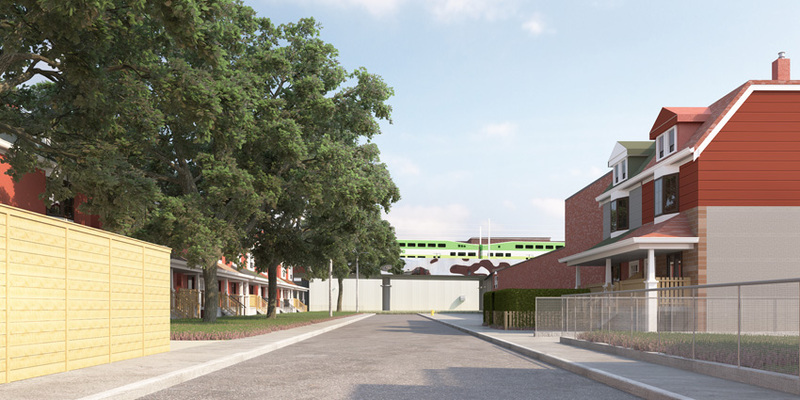 Metrolinx also announced the commencement of the Transit Project Assessment Process on January 28 and outlined its commitment to funding the cost of the improved structure and public space which is estimated to be $210 million. Let’s continue to work together to help inform the project’s next stages. Please join us in person or online and be part of the project. RER builds on the first wave of Big Move projects, such as the Eglinton Crosstown LRT and GO’s expansion towards two-way, all-day rail service. The Davenport Diamond Grade Separation project is an early infrastructure expansion to enable future RER service on GO Transit’s Barrie line. Currently, the Davenport Diamond rail crossing causes service reliability for both commuter and freight services and will be a larger impediment to getting our GO customers to their destination as RER service is expanded. 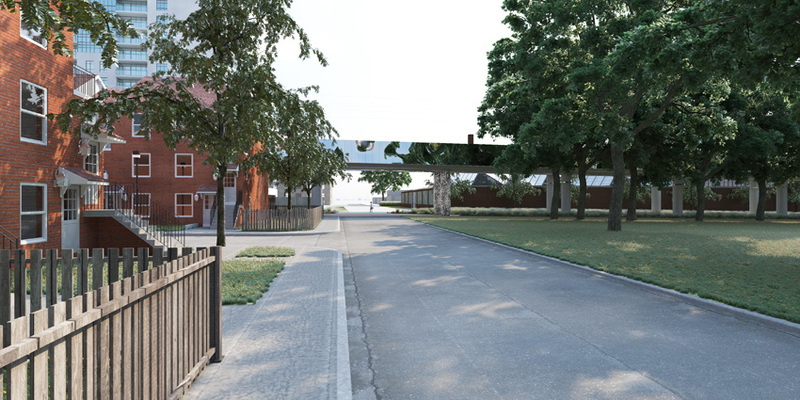 This overpass 3D model does not reflect the latest initial design concept. The Davenport Overpass 3D model was created for conceptual purposes only. The overpass structure is a very early preliminary design and does not reflect what the overpass will look like once the detailed design and the design excellence process is completed. The concept is subject to change as the design process unfolds. 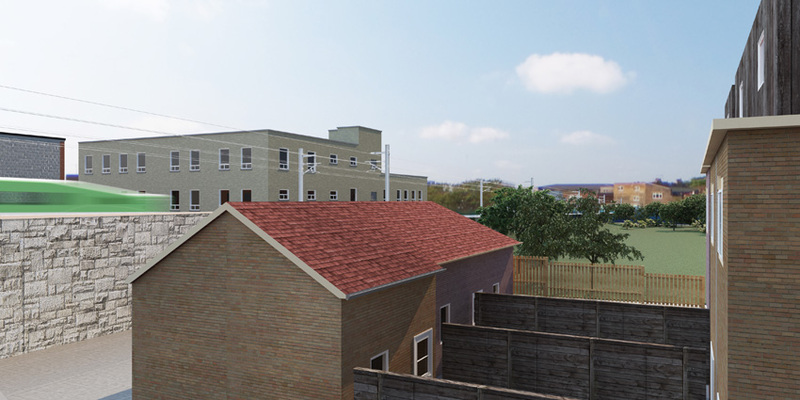 Any future developments modelled may be subject to changes as the project moves through the approvals process. The model is being shared in response to community feedback to review what preliminary work has been done for the Davenport Overpass. On the evening of June 23, over 50 community members attended the Public Roundtable Meeting to discuss the project’s technical studies and the recommendations from the Davenport Diamond Grade Separation Residents’ Reference Panel. Elise Croll, Director, Environmental Programs and Assessments, Metrolinx reviewed the many technical studies (e.g. noise and vibration) Metrolinx is completing as part of the environmental assessment process. Peter MacLeod, the moderator for the Residents’ Reference Panel, presented an overview of the 89 Panel recommendations and provided some context for how the Panel worked together to arrive at its final recommendations to Metrolinx. The 36-member Davenport Diamond Grade Separation Residents’ Reference Panel met for the first time on Saturday, April 25, 2015. The group listened to the following presenters and completed a site tour in the afternoon. The group finished up the day by brainstorming ideas to finish the sentence “A great overpass project will...” Please visit our Davenport Panel page to learn more about the day and the ongoing work. Discussion #1 – centred on getting attendees to share how they think the overpass will affect the Davenport community and what can be done to improve the impact of the Overpass on the community. What is the Davenport Diamond Grade Separation? Metrolinx, the provincial agency responsible for regional transportation, is planning to build an elevated rail corridor that follows the current GO Transit route between Bloor Street West and Davenport Road. The Davenport Diamond Grade Separation project is intended to eliminate the ‘Davenport Diamond,’ one of the busiest train track intersections in North America, where CP freight trains and GO passenger trains intersect at a ground-level rail crossing. As part of the protocol, we are presenting the preferred option of elevating the GO Transit rail corridor above the CP Rail tracks to remove the Davenport Diamond crossing during the TPAP process. We will also present the findings for the other reviewed options and the explanation of why they were not considered as feasible as the preferred option. Metrolinx is expected to begin the TPAP in January 2016. At this time, Metrolinx is engaging the community and stakeholder in pre-TPAP discussions to explain the Davenport Diamond Grade Separation project, listen to any concerns or issues, and to prepare the community and stakeholders to the commencement of the TPAP process. Metrolinx is planning to build the Davenport Diamond Grade Separation as it is the only option that offers the greatest potential for community benefits and opportunities. Here is a list of what is possible by ‘unlocking’ the land underneath the elevated portion of the GO Barrie rail corridor. By elevating the rail corridor, the tracks will no longer be a physical and social barrier for the residents of Davenport. The removal of this barrier creates the potential to reconnect streets such as Paton Road and it increases the access to community spaces such as Erwin Krichkhahn Park and Campbell Avenue Park to residents on the east side of the rail line. Possible opportunity to create a north-south connection as well as east-west connections. There is an opportunity to take a sterile, industrial rail corridor and transform it into an engaging, accessible space that is functional, safe and visually appealing. The possibilities for this space will be explored through community consultation. There are many opportunities for members of the Davenport community and other stakeholders to have their say on the Davenport Diamond Grade Separation project. Metrolinx is out early in the environmental assessment process to ensure that everyone has an opportunity to understand what we are doing, share their issues and concerns, and work with Metrolinx to ensure that we leave a lasting legacy beyond expanding transit infrastructure. Here are some of the ways you can be involved in the engagement process. A Residents’ Reference Panel is a forum of residents who agree to volunteer and represent the interests and perspectives of their community. Reference Panels typically meet over a series of Saturdays to learn about a particular public policy issue and provide careful and informed advice to public authorities and decision-makers. Reference Panels encourage participants to learn from one another as well as from experts, as they work towards a consensus concerning the best route forward. Invitations were sent out to 10,000 households in the Davenport community to participate in a 36-member Residents’ Reference Panel on the Davenport Diamond Grade Separation project. Members of the Panel will study the proposal and advise Metrolinx on the development of the overpass. If you were not selected to join the Panel, there will be other opportunities to participate and stay informed, including a series of public meetings and regular community updates. Following the Residents’ Reference Panel, Metrolinx will launch its formal six-month environmental process in January 2016 in order to get further input from local residents. For more information, please visit the Residents’ Reference Panel page. Twitter - Follow @Metrolinx and use the hashtag #RERDavenport to stay up to date on the project as we move through our different phases of engagement. E-mail the project at RERDavenport@metrolinx.com. Public meetings – stay tuned for the schedule of public meetings where you can attend to learn more about the project and where we are in the process, and to ask questions of our project team. Visit metrolinx.com/DavenportPanel to stay up to date on the work of the Residents’ Reference Panel. Face-to-Face meetings – the project team is busy meeting with community groups and other stakeholders. If we have not reached out to your community group/association yet, please do not hesitate to contact us at RERDavenport@metrolinx.com. 1. What is the Davenport Diamond? The Davenport Diamond is one of North America’s busiest train intersections located just northwest of the Dupont Street and Lansdowne Avenue intersection. It consists of two lines, Canadian Pacific Railway’s (CP) North Toronto corridor, and GO Transit’s Barrie rail corridor. Service reliability for both freight and commuter trains on these routes is already impacted. The removal of this crossing is an important part of our region-wide plan to alleviate road congestion by increasing passenger rail service. 2. Why does the Davenport Diamond need to be removed? The rail-to-rail intersection currently impacts the reliability of the GO service when it has to wait at the intersection for a CP Rail freight train to pass. With the plans to expand service to two-way, all-day 15-minute GO service, this will further impact the reliability of the service for the expected 22 million passengers expected to use this service each year. 3. What options did Metrolinx review to remove the Davenport Diamond? The results of the Feasibility Study determined that the best solution is to build an elevated GO rail corridor above the CP Rail corridor. The 1.4 km overpass will extend from north of Bloor Street West to just south of Davenport Road. This option minimized the impacts as much as possible and maximized the benefits and opportunities for the surrounding community. Here are some of the key reasons for choosing the overpass option. Hundreds of millions of dollars in savings which will be reinvested in expanding transit in the City of Toronto and the rest of the region. 4. How did Metrolinx arrive at the preliminary design direction presented to the community on January 18, 2016? 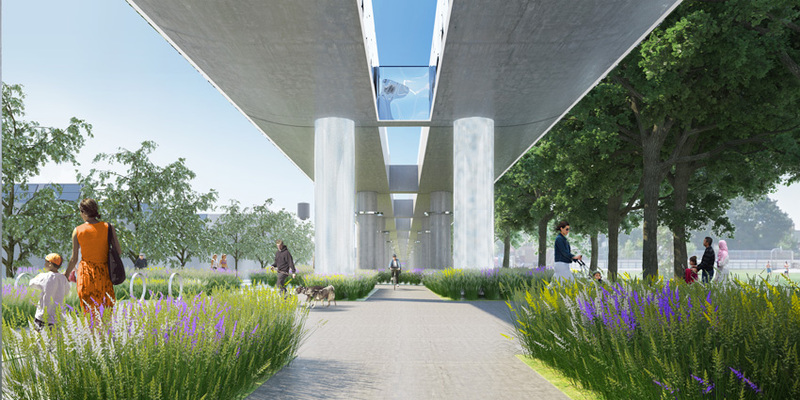 Metrolinx convened a team of award-winning urban designers and architects with one mission: to minimize the visual impact of the overpass and to make it the best it could be. The group used the 89 recommendations from the Residents’ Reference Panel to help guide the work and inspire what is possible. 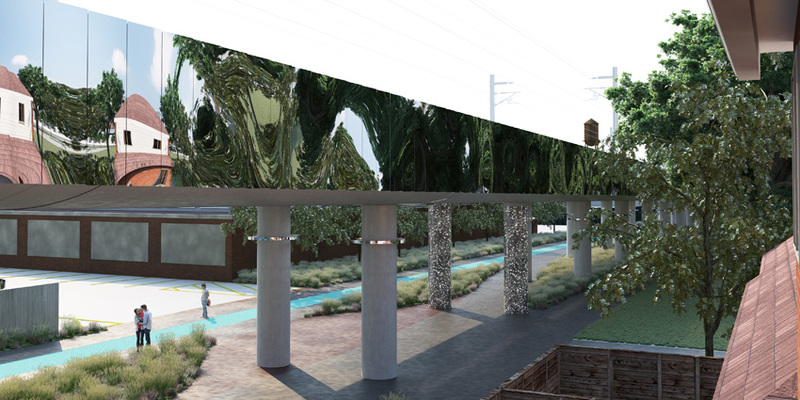 The preliminary design direction (Guideway and Greenway) lightened the structure considerably, introduced a skylight element to allow natural light and rainwater below the structure, designing lighting to bring the space to life and used materials such as stainless steel cladding to reflect the surrounding views to be integrate the overpass into its surroundings. This preliminary design direction will continue to evolve as we gather community feedback and work through detailed design. 5. What are the long-term impacts and opportunities from the Guideway and Greenway concept? Significant investment in public realm improvements including a naturalized landscape strategy and new plantings along the length of the overpass and a new multi-use path from Davenport Road to Bloor Street West, including a pedestrian and cycling bridge over the CP Rail Corridor. 6. 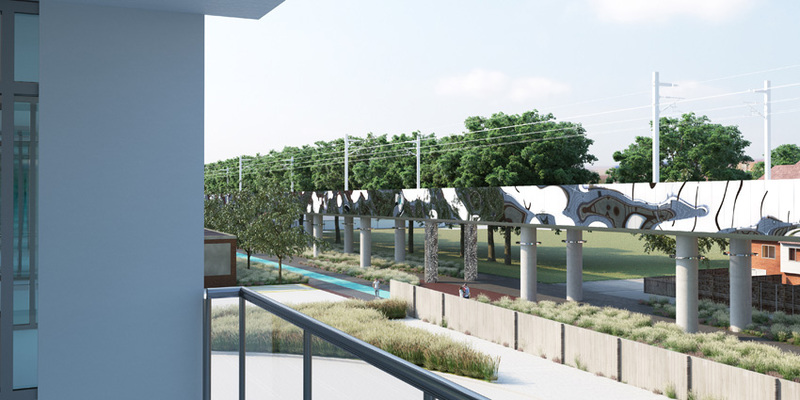 How will construction of the Guideway and Greenway concept impact the community? 7. How much will the Guideway and Greenway concept cost? 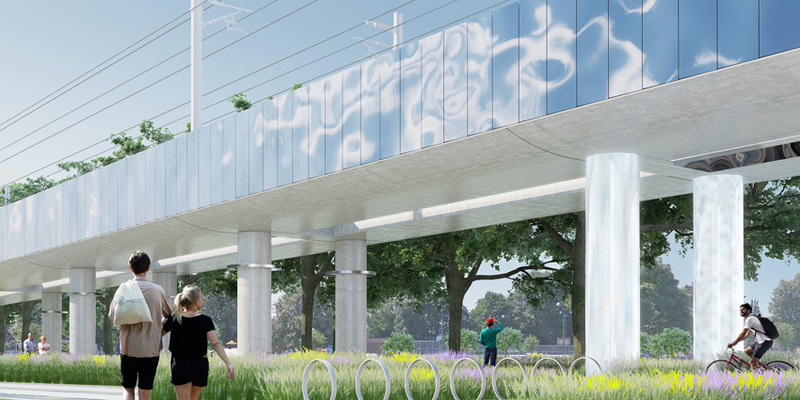 Metrolinx has increased the initial investment of $140 million to approximately $210 million to invest in public realm improvements in the form of integrated art, lighting, multi-use path (Greenway) and structural design (Guideway). 8. How high will the elevated rail corridor be? 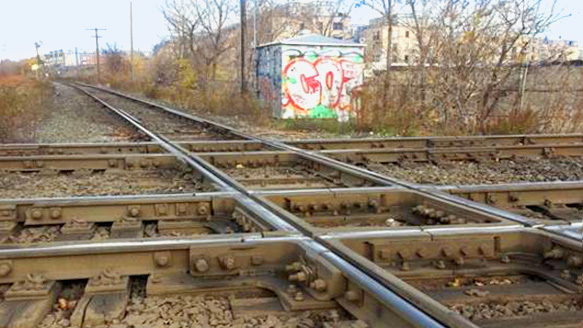 The rail corridor will begin to rise north of Bloor Street West and reach a maximum height of 8.5 metres as it crosses the CP tracks just north of Dupont Street. 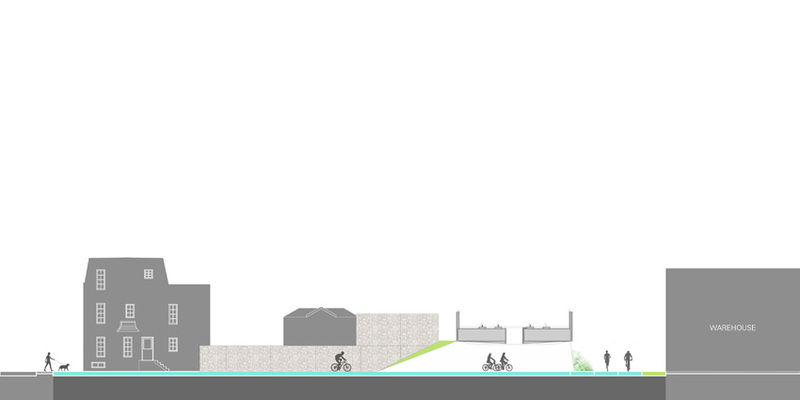 The rail corridor will then begin to descend, reaching ground level as it crosses the Davenport Road bridge. 9. How is Metrolinx engaging with the community? Metrolinx began the conversation with the community and stakeholders in late winter/early spring of 2015. One key initiative was launched early on to get feedback from the community on how create the most public benefit. A Residents’ Reference Panel made up of 36 random local residents and business owners came together over four full Saturday sessions to draft 89 recommendations to Metrolinx to maximize the public realm opportunities from the transit expansion project. These recommendations have helped inform the current preliminary design direction for the overpass. Metrolinx has also done the following to engage as many people as possible on the project. 10. What concerns have been raised during the engagement? Metrolinx has received a wide variety of feedback for us to do nothing, build a tunnel, commit to a station at Bloor Street West and to make the overpass an asset and not an eyesore. As well, folks are concerned about noise, vibration, air quality and the visual impact from all the options including the preferred option to build an overpass. All of these concerns are being addressed in the Transit Project Assessment Process (TPAP) and in the preliminary design direction . In fact, the preliminary design direction shortened the exposed open section of the overpass from 847 metres to 570 metres to minimize the visual impact from the Guideway. 11. How will Metrolinx continue with engagement during the TPAP and post-TPAP? Metrolinx will continue to engage with the community during the TPAP process to ensure that everyone has an opportunity to better understand the preliminary design direction and to share their feedback. As well, Metrolinx is planning to create a community advisory group to help Metrolinx implement the Greenway component of the initial design to ensure that the unlocked public space is activated and maintained over the long term. 12. Why is Metrolinx releasing these preliminary design direction renderings now? Why weren’t they made available earlier in the process? Metrolinx went out very early on in its engagement process before much of the technical work was completed. We wanted to give our stakeholders and neighbours an opportunity to engage before we had all of the answers. In fact, a lot of the feedback we heard have shaped our design and thinking including the 89 recommendations received from the Residents’ Reference Panel. 13. Why is Metrolinx ignoring the City of Toronto’s request to pause the Transit Project Assessment Process (TPAP)? Metrolinx respects all of its municipal partners and works together with them all to deliver the province’s goal to get people moving in the City of Toronto and across the region. However, from time to time, there will be a difference of opinion with regards to a direction or project. Metrolinx will not compromise on building transit projects. Metrolinx has previously delayed the start of the TPAP to provide the City of Toronto more time to review our materials. Any additional delay will mean delays in our ability to electrify the corridor and to deliver the increased levels of service that the province committed to residents would be in place over the next 10 years. The City will still have the opportunity to comment over the next six months during the TPAP process. 14. Why is Metrolinx ignoring the City of Toronto’s motion supporting the tunnel option? Metrolinx respects the City of Toronto’s decision to support the tunnel option. However, from time to time, there will be a difference of opinion with regards to a direction or project. However, we will not compromise on building transit projects that minimize impacts and maximize benefits while investing taxpayers’ money as efficiently as possible. We will continue to work with our partners and the community to make this the best possible project. There will be plenty of opportunity for further engagement and feedback during the Transit Project Assessment Process. 15. Why is Metrolinx not listening to the Davenport community as it prefers a tunnel? Metrolinx has been engaging with the Davenport community for almost a year now. We have heard a variety of opinions on how to remove the Davenport Diamond, including a tunnel option. Also, some people feel that removing the diamond is not necessary at all. We understand that no matter what option we choose to move forward with, it will have impacts. However, our goal is to minimize the impacts as much as possible and maximize the benefits. 16. Why is Metrolinx not committing to building a station at Bloor Street West as part of this project? A station at Bloor Street West on the Barrie line has been shortlisted as a potential new station as part of the new station analysis that is being completed. Results of this analysis will be completed for spring 2016. 17. Why is Metrolinx not committing to building a station at St. Clair West? A station at St. Clair West on the Barrie line has been shortlisted as a potential new station as part of the new station analysis that is being completed. Results of this analysis will be completed for spring 2016. 18. The City of Toronto’s Chief Planner has said the Missing Link would negate the need for this project. Has that been considered? The Missing Link is a study looking at the possibility of building a new corridor that would divert freight traffic off the Milton and Kitchener corridors to allow for the increase of GO train service to communities along the lines. Metrolinx has been working with rail and municipal partners on this study however for it to become a reality it would require competitors CP and CN to work together and agree to share the same corridor, government funding to purchase the line which is estimated to be at least $5 billion, and an environmental assessment. This process could take more than a decade and should all these pieces come together, the increase in passenger train traffic would still result in the removal of the Davenport Diamond to improve reliability and safety. 1. Why is Metrolinx proposing the overpass as the preferred option while the City of Toronto is supporting the tunnel option? The City of Toronto Chief Planner, in her report to the Planning and Growth Management Committee, has concluded that the tunnel option represents greater long term City building benefits when compared to the overpass. This includes benefits such as removing visual and noise impacts. While the tunnel minimizes these impacts within the Davenport community, it moves these impacts to the Rogers Road community as a tunnel would require raising Rogers Road by approximately 7.5 metres, almost the same height as the overpass, which would also have a lasting visual impact on residential properties and a local school. The Davenport Diamond is located just north of Dupont Street and west of Landsdowne Avenue and so when considering how to minimize community impacts we try to keep the footprint or area of impact contained as much as possible. The tunnel and Rogers Road option presents significant challenges when explaining the rationale and decision making behind permanently altering the neighbourhood to residents when the infrastructure in question is not local. 2. Will the City of Toronto and community still have a say once the TPAP process is completed? The City of Toronto and the community will continue to be part of shaping the design process and the project during the Transit Project Assessment Process and during detailed design.